This is my second post for today. Please scroll down or click here to see my other project. 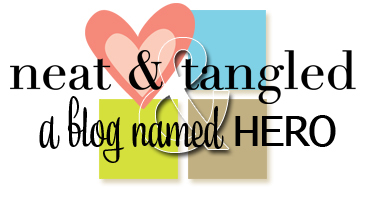 This week at A Blog Named Hero we are creating projects using stamps from Neat & Tangled. Neat & Tangled sells fabulous clear stamp sets and sequins in the prettiest colours. For my card I used the On The Strip stamp set and created a frame for my flower and sentiment. I used Hero Arts Pale Tomato and Tide Pool ink (love these colours together) and I coloured my card base with Hero Arts Ocean Ink. Stop by ABNH to check out what the other Design Team Members have created and just a reminder that there's still time to play in our current Masculine Challenge, with a chance to win a gift voucher from Simon Says Stamp. 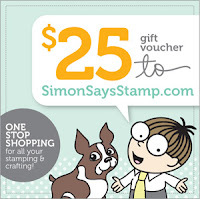 And now you can purchase Neat & Tangled stamps from Simon Says Stamp too! Yipee! Lovin' the aqua and red combo, Sue! Your frame is beautiful - such a fun and creative way to use that stamp set! Your card is my favorite from the DT - everything is just perfect! Crazy about how you created this fame. Awesome.